Woho! 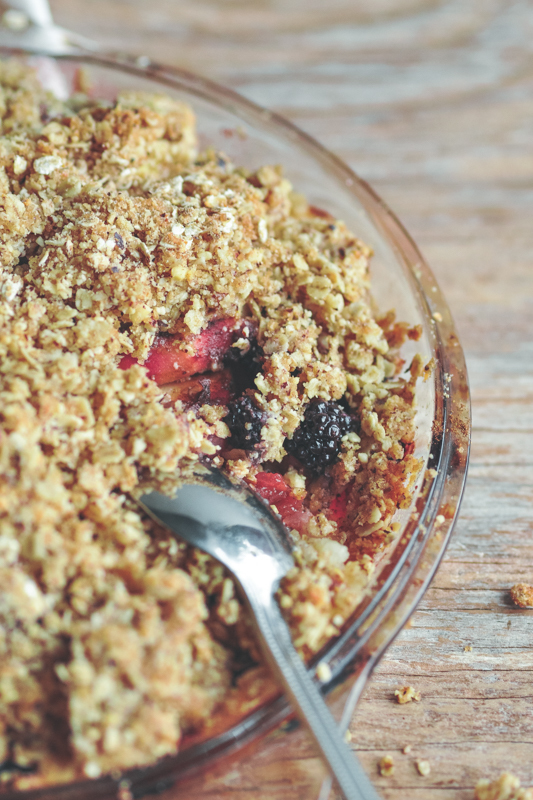 The first new recipe for my new site, an Apple & Blackberry Crumble is here. I really hope you are excited about this as I am. Especially since it was 1st of July since I last put up something here, and back then the website looked vastly different. When I decided to re design it, I knew that it was a big project and that it would take me some time to do it. The summer months seemed to be the perfect time to get going as clinic wise this tends to be a slower time of the year for me. Having said that, it wasn’t my preference to spend all that screen time when the weather was so lovely. 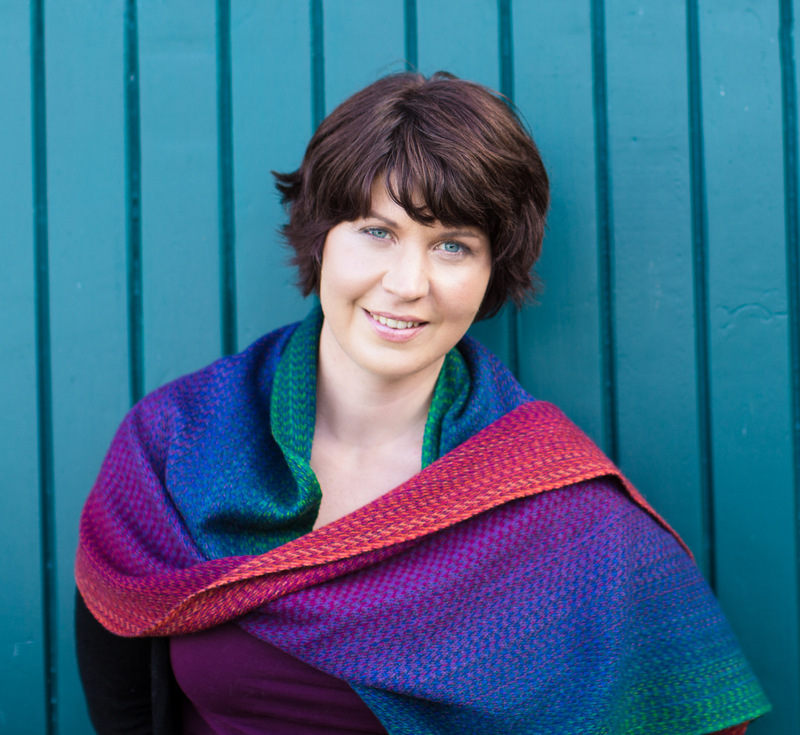 On the upside, there were days when it was almost too hot to be outside (imagine saying that about an Irish summer! ), so eventually it all came together. The feedback has been lovely so far and if you have been hanging around here before, then I hope that you can still find your way around just fine. I am happy enough with how this re design turned out, and glad that all the tech skills that I have amassed over the past five years or so came to good use. 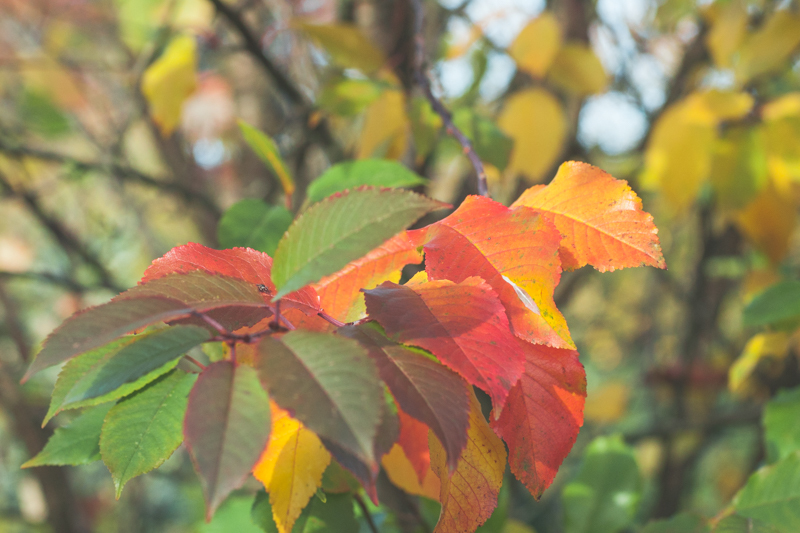 Another positive thing was that my blogging hasn’t been weekly over these past five years as I had to do some minor editing to all my blog posts and 125 of them was more than enough to be honest! Creating and developing recipes that are seasonal requires some timing. If you are using seasonal ingredients then making winter recipes in July is a challenge and it may also mean that sometimes when you create a recipe in season, by the time it is ready to be published the season has passed… That’s exactly what happened with this Apple & Blackberry Crumble. When I moved house last year, this was one of the first things I made. Because I liked it so much I made it several times when I had people over for dinner. It is a spicy twist on a seasonal classic. 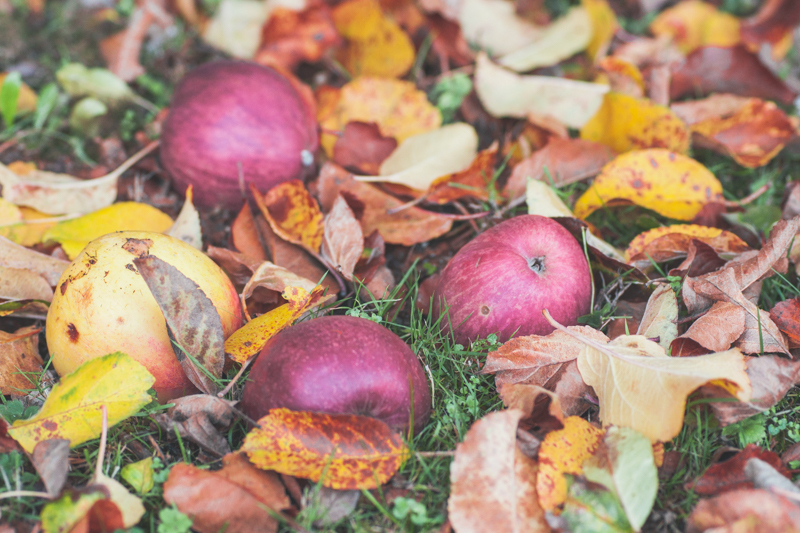 The crumble is crunchy and buttery and the apples are tart. Using Chinese Five Spice, which is a spice blend made up of cinnamon, fennel, star anise, cloves and black pepper was born out of curiousity. All of these spices individually pairs well with apple so I thought, why not in a crumble? 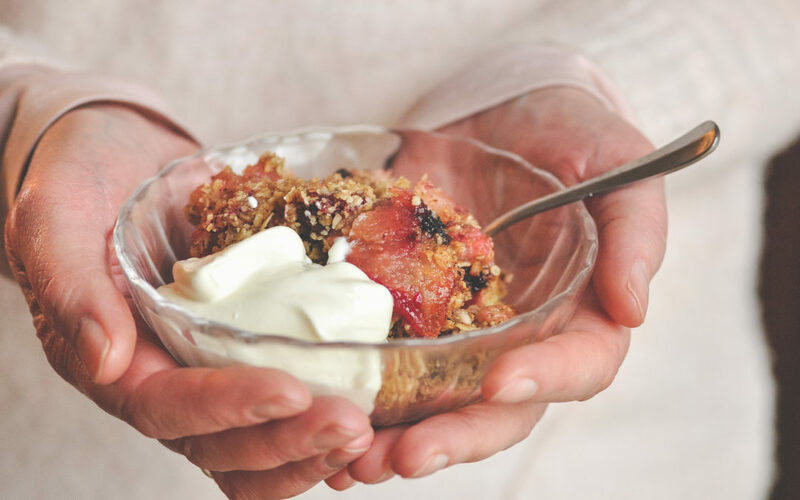 The result is something a little different but more interesting than your typical apple and blackberry crumble. 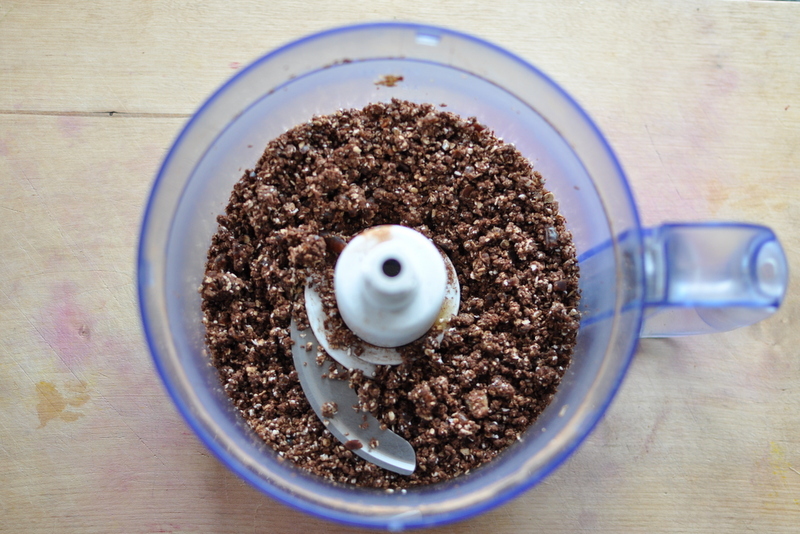 Using ground hazelnuts add to the seasonality and oats makes for a crispier crumble topping. If you don’t have blackberries, just omit. Or be bold and add something else like blueberries or blackcurrants. Heat your oven to 180˚C. Peel and core your cooking apples then cut them into neat slices. Toss the apple slices in the Chines Five Spice and the ground cardamom and then place them in an oven proof baking dish. Scatter over the black berries. 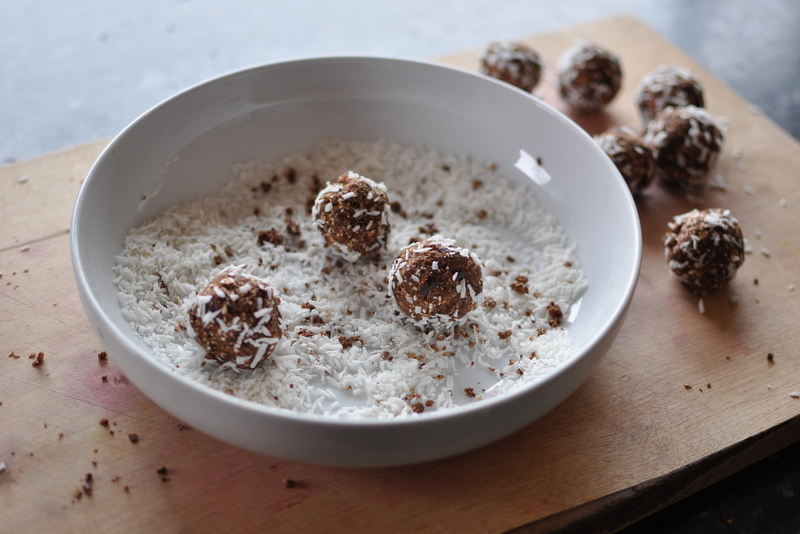 In a separate bowl add the ground hazelnuts, sugar, rice or spelt flour and rolled oats. Mix it all together with a spoon. Then add the cold butter into the flour mix and with your hands rub the butter and flour together until you have what resembles bread crumbs. 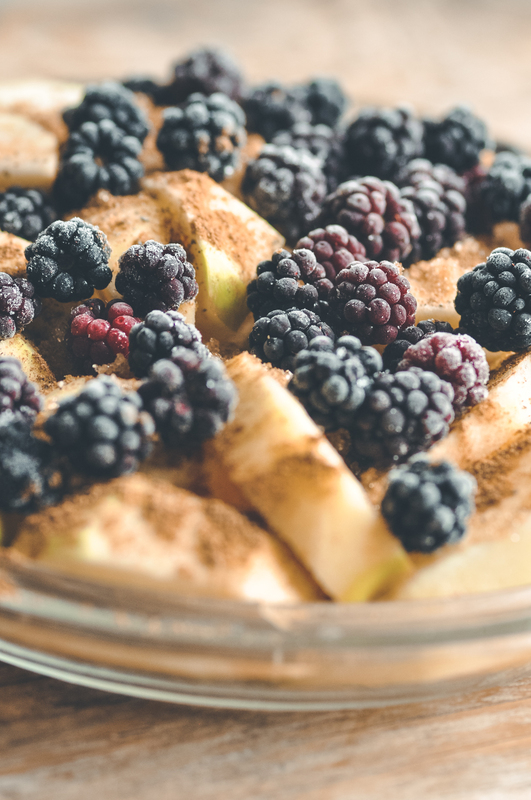 Scatter the crumble topping evenly over the apple slices and black berries. Then bake in the oven for 35 min until golden and the apples are soft. I like serving this with sour cream or crème fraiche, as the tartness works well with the spices. However a really nice vanilla ice cream would be good too. As I am striving to simplify my life with less stuff, I also feel a draw to create recipes that reflects that. 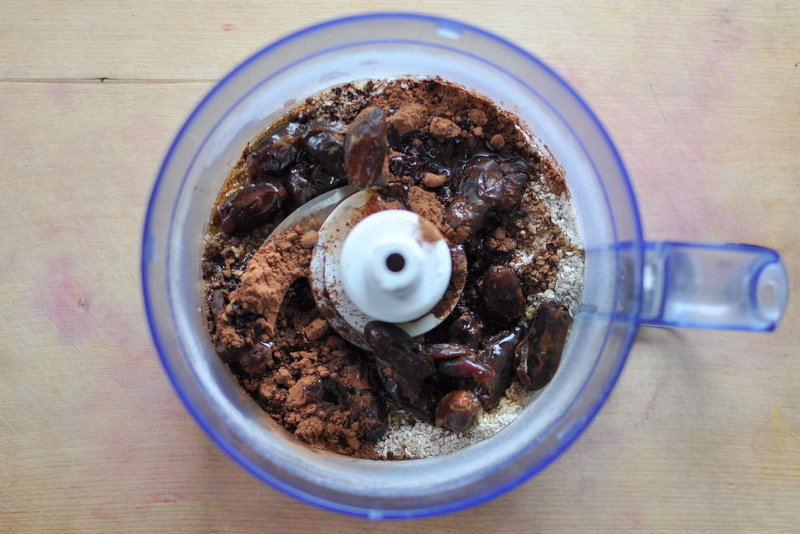 Amid the current hype of “50-fancy-ingredient-lattes”, what I want is something tasty and comforting made from just a few store cupboard ingredients. Maybe it is my shift towards digging deeper into the social justice side of health, or it is a subconscious longing for my Swedish roots. Or maybe it is having a somewhat constrained food budget… I don’t know. What I do know is that there are some real delights to be had, by the skill of being able to turn just a few simple ingredients into something yummy, especially when the weather has you all down. These cookies, or biscuits where something I made several times this past winter. It was like my body craved something energy dense in order to cope with the long cold wet days. But maybe it was just my tastebuds calling out for something with the combination of fat and sugar. 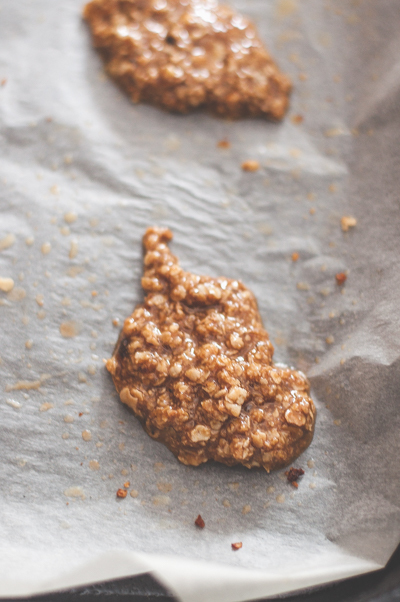 Either way, these basic oat cookies hit the spot every time! 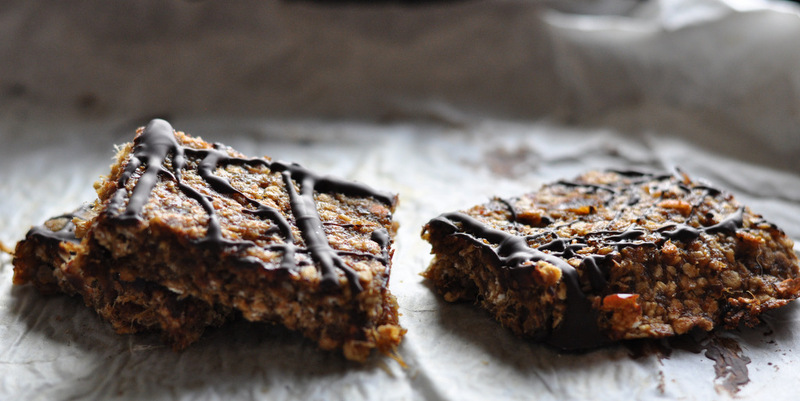 The initial obsession with this particular ingredient combination started off when I spotted a flapjack recipe on Instagram. Over the course of my trial and errors developing this recipe, I learned that the ratios of sugar/oats/butter/honey will affect the texture and quality of your end product. 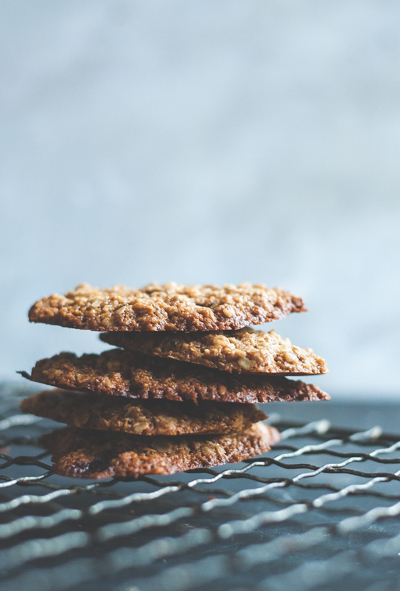 More butter – Less oats will give you a crispier kind of cookie. 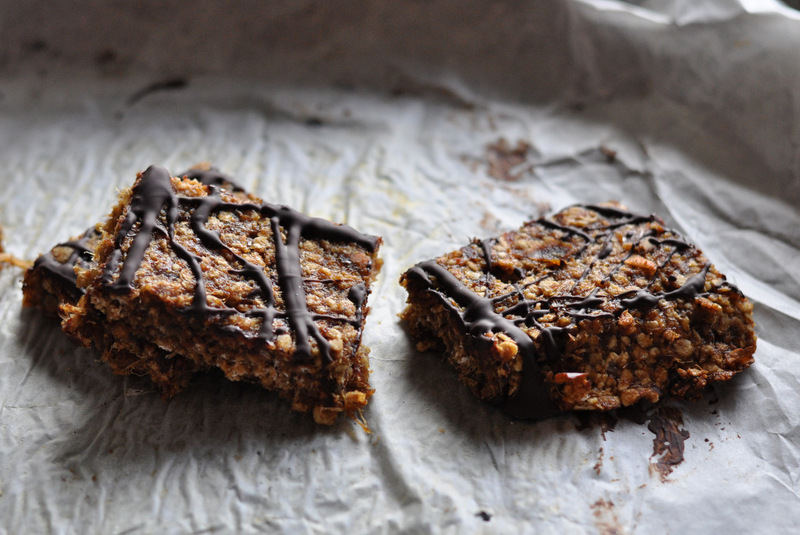 Increasing the ratio of oats and you’ll end up with more of a flapjack, chewy kind of bar. 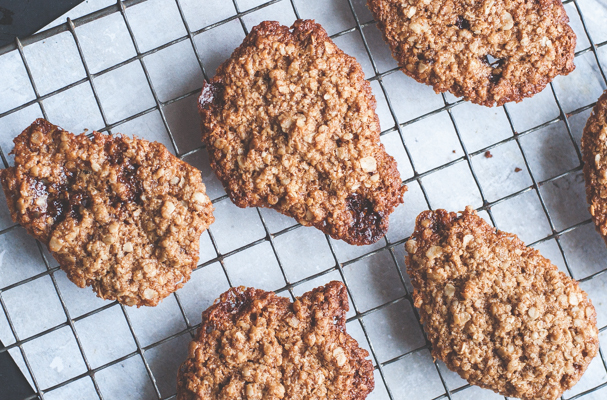 To be honest, what I was aiming for was something like the Swedish oat cookies called ‘Havreflarn’, which is a crispy candied type of cookie. The thing is, the recipe for Havreflarn uses wheat flour also and I wanted to try and recreate something without it. You know how it goes though… Baking, apparently, is an exact science so if you go changing any one component, you most likely will not end up with what was the intended outcome of the original recipe. 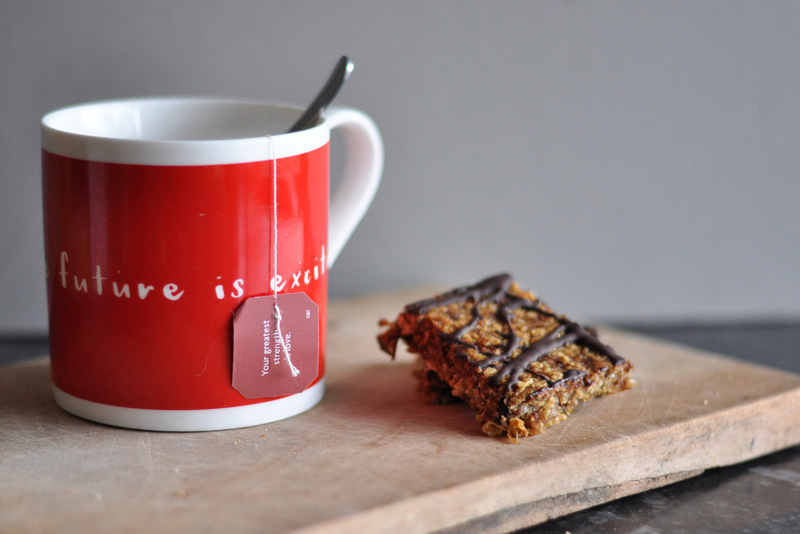 Never the less though, it can be equally tasty and satisfying! Which which I am, self proclaiming about this recipe experiment that I am sharing with you here. This recipe is super handy because you can mix all the ingredient directly into the saucepan that you use to melt the butter. Less washing up that way! Heat the oven to 185°C and line a baking sheet with parchment paper. Using two spoon, spoon a dollop of cookie mixture on to the lined baking sheet. If you want them a bit neater looking than mine then shape them up a bit. Leave some space between each dollop as you don’t want your cookies flowing into each other. Bake for about 7 min until golden and a little brown around the edges. Let the cookies cool on a rack before tucking in. They will firm up a little as they cool. Let’s continue the Summer Salad Series! I know we are already halfway through Aug but still… In a sense, as this salad contain several cooked elements it’s the perfect transition from summer to autumn. It’s still pretty fresh with an element of summer, containing juicy nectarines, yet it has that autumnal feel that root vegetables bring. I was told once by a man that apparently in Japan most people eat 20-30 different types of foods, including spices every day! How’s that for variation? Now, I will admit that I haven’t verified his statement to see if it’s true or simply a myth, but whatever way, ask yourself “How many different foods and flavours are you eating every day?” By making this salad you will end up with nine (!) different components alone. Let’s get going with the recipe! Beetroot is back in season and the peaches and nectarines are still around. I also used whole cooked oats in this salad to make it a complete meal on its own. Whole oats are delicious and very filling. Eating cooked grains like this is a great way to get your whole grains in. They are a good source of fibre keeping your bowel working as it should, plus fibre ads bulk and help us stay full for longer. Whole grains are also a great source of B-vitamins which are essential to a well functioning nervous system. It’s important to remember that B-vitamins are water soluble vitamins, which means our bodies don’t really store them. When we are stressed we have a higher requirement for B-vitamins so it is important to make sure you get plenty if you are having a hectic lifestyle (and who hasn’t). 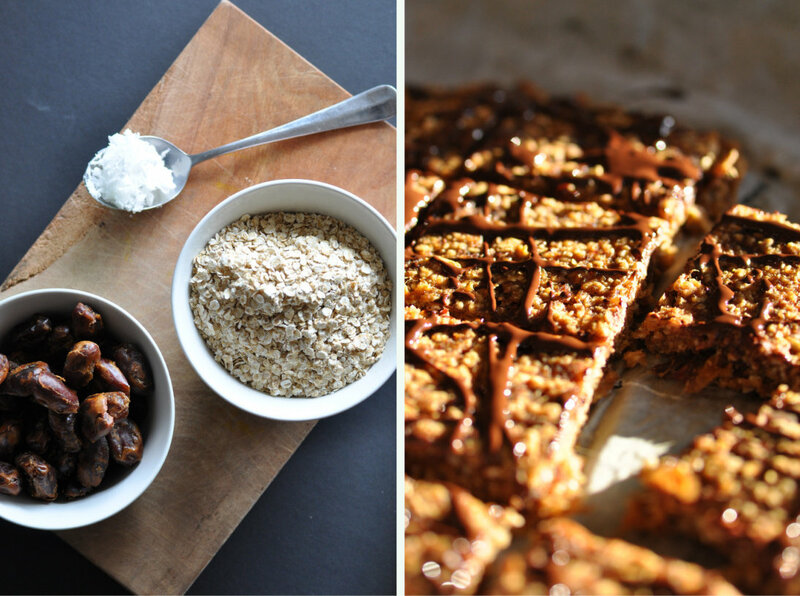 If you can’t have oats then you can easily sub them for cooked quinoa instead. The fresh mint leaves add another interesting dimension to this cooked salad. Enjoy! Pre heat oven to 175°C. Place your peeled and chopped beetroot on a baking tray. Drizzle with olive oil and season with the ground cumin a pinch of sea salt and black pepper. 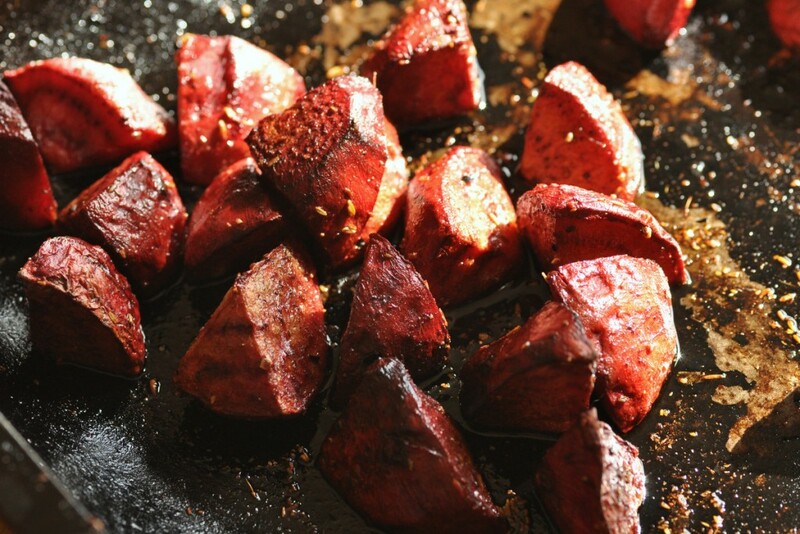 Toss the beetroot in the oil and seasoning to make sure they are evenly coated. Place the tray in the oven and roast for about 35 min or until the beetroot is nice and soft. In the meantime, place your washed and rinsed oats in a saucepan and cover with water. You want to have about an inch of water covering your grains. Bring to boil and then reduce to a lively simmer for about 20 min. If it looks like your pan is getting to dry add some extra water. 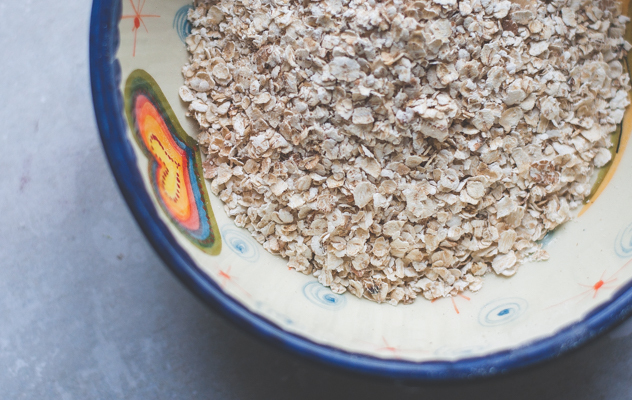 The oat grains are cooked when they become slightly transparent in right the way through. Once the oats are cooked through, put them into a sieve and drain any excess water. While they cool, make the dressing by mixing olive oil and lemon juice together in a bowl. Season with a pinch of sea salt if you wish. Once the oats have cooled down somewhat, mix in the dressing. 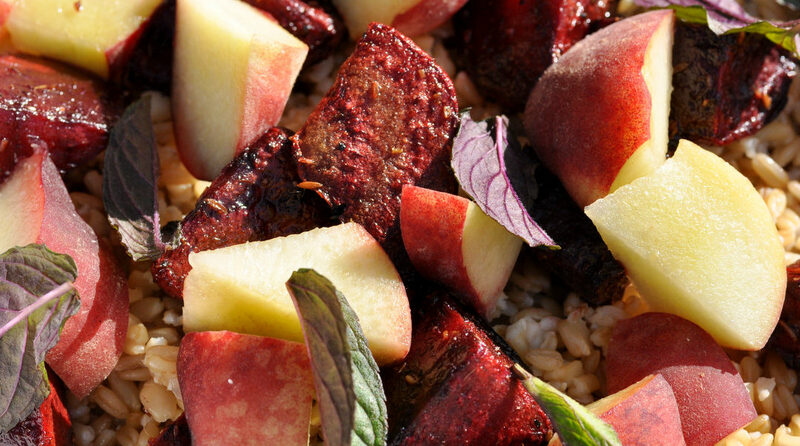 Place your dressed oats, the roasted beetroot and the chopped nectarine in a large bowl. Scatter some fresh mint leaves over the top and enjoy. 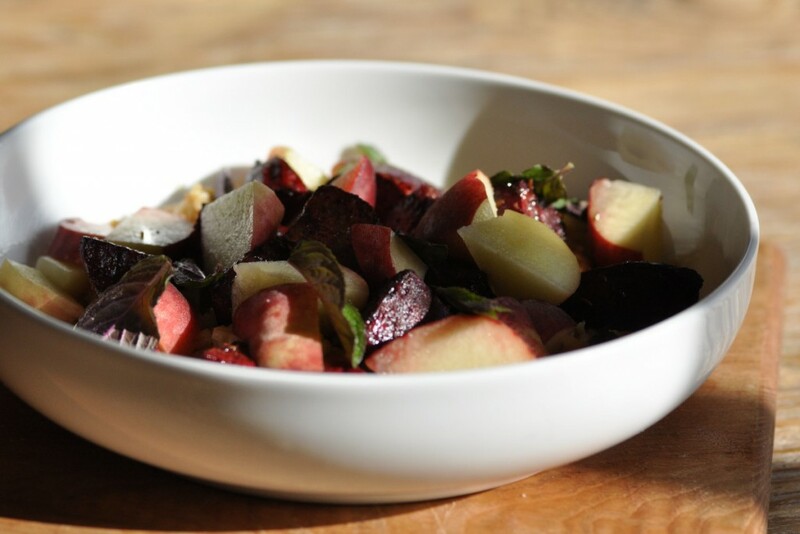 This salad makes a nice lunch the following day as you can cook both beetroot and oats ahead of time and then just assembles with the fresh nectarine and mint before eating.